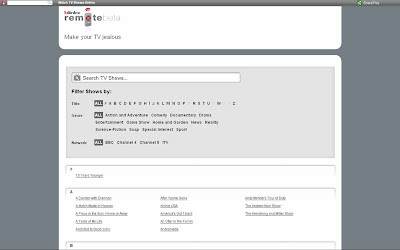 Blinkx Remote indexes all legal, freely available TV online and has launched in the UK today. Blinkx Remote results will be derived from the freely available on demand services such as the BBC iPlayer, 4OD, ITV.com and Five. Blinkx Remote will also include shows from other non-UK broadcasters, such as CBS, that are available to UK viewers. The Blinkx Remote index includes around 1000 UK shows and up to 400 available from the US. Blinkx does not have broadcast partnership deals but uses publicly available data in the same way that Google News indexes freely available news sources. Universal Search has been slow to develop and relevance has been a problem as Universal Search continues to serve up a mixture of text, images and video from both services like YouTube and catch up players. Blinkx Remote aims to make it simple for users to find the TV programmes either through using a Search Box or through sorting by genre and title. Blinkx Remote is not trying to monetise the service yet but there are obvious promotional and advertising opportunities for the future - especially if Blinkx are able to introduce personalisation so users can customise listings and feed these through to their own social network profiles. Whilst all the talk has been about Cuil this week, I think Blinkx Remote is a more significant development. Cuil attempts to challenge Google directly, aiming to offer more effective Search results, whereas Blinkx Remote is something new, operating in a space that Google have not yet mastered. It will be interesting to see where this goes but Blinkx Remote appears to have stolen a march on the other Search Engines and the ability to easily find online TV shows could substantially boost online TV viewing.